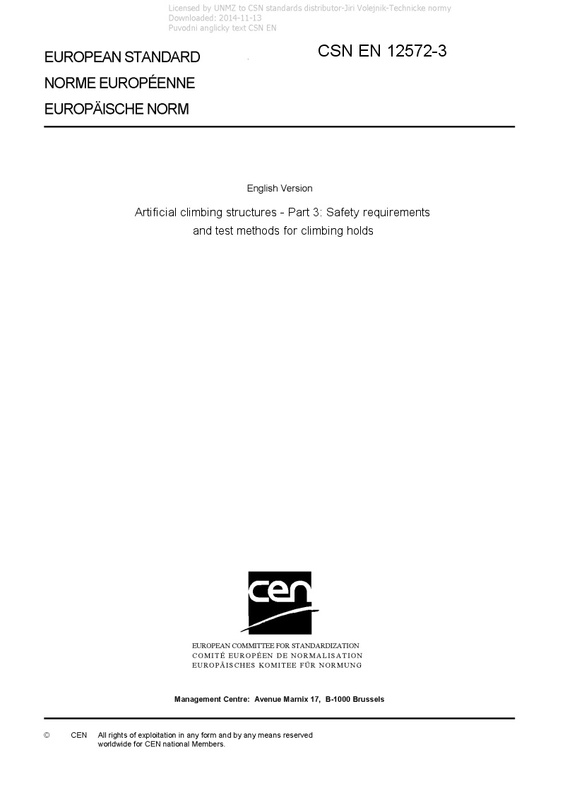 EN 12572-3 Artificial climbing structures - Part 3: Safety requirements and test methods for climbing holds - This European Standard specifies the safety requirements and test methods for climbing holds. This European Standard is applicable to climbing holds, which are used for the natural progression of the climber, i.e. without the use of artificial means (e.g. ice axes, crampons, hooks, nuts) on artificial climbing structures (ACS) and bouldering walls. Climbing holds are designed to be mounted on the ACS with bolts, screws, etc. Climbing holds include large volumes or features that are designed for use without additional climbing holds being attached to them. The main fixation points for climbing holds forms part of the existing layout of the ACS and are considered in FprEN 12572-1 and FprEN 12572-2. This European Standard is not applicable to ice climbing, dry tooling and playground equipment.